Yet there is something about Michael Wolff's tirade that deeply resonates, albeit on the other end of the Acela Corridor. We are referring, of course, to the "idiots" who are buying the S&P 500 at 2735 and earnestly debating the pros and cons of bitcoin at $16,000; and to the "boys and girls" (nee "children") on Wall Street who have a hissy fit every time Washington---either via its central banking branch or statutory and fiscal tools----even vaguely mutters about financial discipline or eventually cutting off all the fiscal and monetary free-stuff. This morning, in fact, we heard one of the street's permabulls describing the current madness as a state of stock market "nirvana" that will carry the S&P average to 3,100 in the near future. That's right. While that particular figure would equate to 29X LTM earnings for the S&P 500 and about 150X for the Russell 2000, it makes no never mind. That's because we have reached the ultra-FOMO (fear of missing out) stage of the bubble mania, where the only thing that matters is the price action. That is, what is being bought in the casino is what is going up, and for the sole reason that it is going up. All else is just after the fact rationalization, such as the meme-of-the-moment holding that the US economy is "strong" and the global economy is being powered by "synchronized growth"; or it constitutes studied insouciance, such as the flippant dismissal of the unprecedented crisis of governance shaping up in Washington as being essentially irrelevant to the outlook for the economy and financial markets. As to the studied insouciance part and the unfolding collapse of governance in the Imperial City and meltdown in the Oval Office, we can only profess utter amazement. During exactly 50 years of closely observing the beasts of the beltway, we have seen nothing remotely like Wolff's expose----exaggerated or not---of the sheer dysfunction, incompetence, intrigue, fratricidal conflict and egomaniacal impetuousness that pervades the Trump White House. We actually had a window into the Nixon White House back in the day, and it amounted to a Sunday school picnic by comparison to the Wolff narrative. Indeed, there is absolutely no doubt that the Donald is sui generis, and not in a good way as it bears upon the stock market outlook. In fact, he is not simply the Great Disrupter; Trump may eventually prove to be the Terminal Disrupter. Under the Donald's watch, the Imperial City is being turned into one giant kick-the-can-alley. And that includes the asinine tax bill the Hill Republicans passed---- sight-unseen and with fiscal recklessness aforethought. Its Christmas Eve passage was not an act of governance at all; it was a desperate political maneuver designed to distance Congressional Republicans from Trump and to establish the predicate for a 2018 campaign pitch touting the GOP majority's accomplishments on Capitol Hill----Donald Trump to the contrary notwithstanding. Yet this reckless tax bill gambit is only going to turn the existing fiscal vice into a virtual legislative torture rack. As we have explained, staring Washington in the face at the next CR deadline on January 19th is upwards of $500 billion of add-on spending for FY 2018-2019. Needless to say, there is absolutely no consensus within the GOP, virtually no route to bipartisan resolution, and therefore no way foreword except for stop-gaps and temporary patches that will soon have Congress tied in knots and pulsating with bitter partisan and factional conflict. For instance, the GOP hawks (that's most of them) are insisting on a $120-$160 billion add-on for defense during the next two years. At the same time, the Dems and the RINOs (Republicans in name only), who control a veto bloc within the tenuous GOP majority in both houses, are demanding "parity" for domestic add-ons above the sequester ceilings (i.e. above the levels the GOP forced down Obama's throat to rebuke his horrible fiscal profligacy). That adds up to about $300 billion over two years and it may well finally get there, but only after several more temporary CRs or other legislative slights-of-hand (such as putting baseline defense and domestic spending in the so-called "Overseas Contingency" which is exempt from the ceilings). And then you have to toss into the red ink pool another $100 billion for disaster aid, $20 billion plus per annum for the ObamaCare insurance bailouts and state high cost patient pools, compromise money for border control/Wall and a lot more interest expense than currently projected. The latter will be far more than considerable when you recall that the revenue loss from the tax bill in FY 2018 and FY 2019 alone amounts to $416 billion. Stated differently, the debt ceiling is now frozen again at $20.456 trillion and the Treasury's cash drawer has only a few weeks of reserves. What that means is that when you add the two year impact of the tax bill and the GOP's spending spree to the baseline deficits, it appears that to get through FY 2019 the debt ceiling will have to be raised to upwards of $22.5 trillion. Needless to say, it's not going to happen---at least on a calm, workmanlike Friday afternoon. A raucous, continuing battle over temporary debt ceiling suspensions of a few weeks or months, or small increases that only kick the can a few quarters down the road, is now guaranteed to be the order of the day. And that will be happening---even as the Fed begins to drain cash out of Wall Street at a $600 billion rate next October and as the expected German successor to Draghi says "nichts" on any further extension of QE next fall. Indeed, the QT (quantitative tightening) pivot is already ramping up in the here and now. During the current quarter ECB bond and other securities purchases will drop from EUR 60 billion per month to just EUR 30 billion, while the Fed's bond dumping rate will rise from $10 billion to $20 billion per month (on the way to $50 billion per month in October). In all, a $46 billion swing toward monetary stringency is commencing this month-----or to drive the point home, a nearly $500 billion annualized reduction in the monetary free stuff being injected into the casinos. In this context, we are hard pressed to understand how the Wolffian White House will cope with the Washington political mayhem and the bond market crunch heading straight down the pike. And its going to get worse, not better. That's because Trump and the House GOP conservatives have finally screwed up there backbones in the face of the RussiaGate hysteria and our opening up investigations of the Clinton Foundation pay-to-play scandal and the egregious political abuse at the top of the Justice Department, FBI and CIA/DNI that launched the whole bogus Russian meddling and collusion story in the first place. Folks, our Madisonian forefathers were no admires of big government and its purported good works; and had a deep skepticism about democracy in the raw. So they designed a government contraption riddled with checks, balances and stalemates in order to throttle any tendency toward tyranny; and to insure that even under ideal conditions the Federal government would only function slowly and in the fits and starts inherent in clearing all the decision hurdles that were hard-wired at the Philadelphia convention. In that context, we are more than willing to believe that Donald Trump will indeed prove to be the Terminal Disrupter. But even if you have considerably more confidence than your editor---and perhaps less cynicism, too---there is no way that the coming fiscal and political conflagrations are going to leave Wall Street unscathed in its splendid insouciance of the current moment. The proverbial Swan is coming, and in the wake of the Wolff Affair and all it portends, we are pretty sure that this time it will be an Orange one. And that gets us to the stupid part. That is, the silly claim that the US economy is somehow reaching escape velocity and cruising into a sustain period of 3.0% or better growth and that the combined boost from accelerating growth and the tax bill will send earnings soaring----as high as $170 per share on the S&P by the lights of Wall Street more enthusiastic hockey stick jockeys. But here's the thing. The US economy is not strong; it's stuttering-----starting and stopping under the weight of $67 trillion of public and private debt; and fatally impaired by a financial bubble induced speculative mania that has turned the C-suites of corporate America into financial engineering joints dedicated to cycling most available cash and debt capacity, not into long-term investment and productivity, but into the near-term goosing of stock prices via buybacks, excessive dividends and unproductive M&A empire building. The 3.0% growth meme is just a risible canard. Two quarters of 3.0% annualized, seasonally maladjusted real GDP growth are hardly worth the paper they are printed on in the context of today's structurally impaired economy. Indeed, we had two back-to-back 4.0% plus growth quarters back in 2014 and they promptly disappeared from sight as the Red Ponzi induced commodity mini-boom rapidly cooled sharply in 2015-2016. The chart below strains out the inventory stocking/destocking noise implicit in today's credit driven global economy, and shows that the current expansion rate of real final sales is 2.39% on an LTM basis. Yet that's exactly the same 2.39% rate of gain posted 22 quarters ago in Q1 2012. In the interim, of course, the US economy's path undulated more or less in line with global credit, commodity and trade impulses. Yet during the five quarters of 2014-15 when real final sales growth exceeded 3.0%, the Wall Street bulls were noisily pronouncing that "escape velocity" had been obtained and that the economy was off to the races. Not by a long shot. By early 2016 the growth rate dipped under 2.0% and has been struggling to rise materially above that level ever since. So the real question is not why this time is any different. The obvious reality is that it is just another cycle of the same. That is, the 19th Party Congress is over, and Mr. Xi has been coronated as the absolute ruler of the Red Ponzi. Accordingly, even he recognizes that now is the time to wrestle down China's tottering $40 trillion house of debt cards before the whole scheme comes crashing down on Beijing's ruling elites. 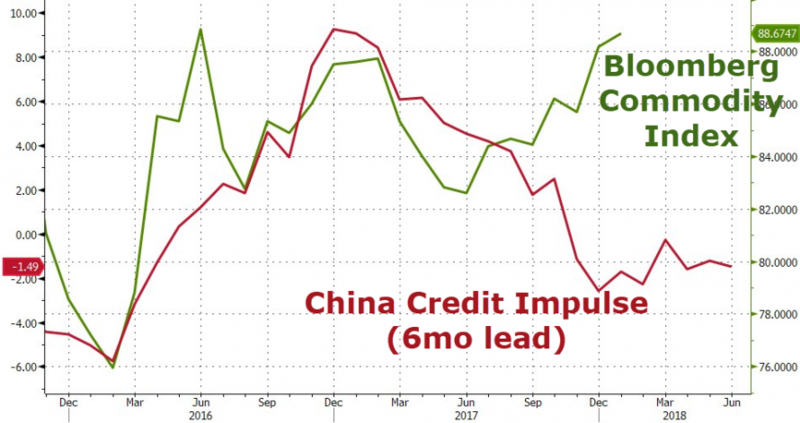 As shown in the chart below, the rate of China's credit growth has already come to a near standstill, and with the usual 6-month lag it will be cascading through world trade and production in short order. So much for "synchronized growth". Alas, the orange bars above are not fixing to erupt above the 3.0% line, but are being pulled downward by the global mini-cycle, and the sheer old-age of a business expansion that will soon equal the 119 month record posted during the far more beneficent conditions of the 1990s. In the meanwhile, LTM S&P 500 earning stand at $107 pre share. That's the same level as three years ago in September 2014, and represents a mere 2.0% annual growth rate since the last cyclical peak 10 years ago. It appears that Michael Wolff has a talent for exposing idiots and dopes. So we think he might well write his next book without leaving his Manhattan airy---save for an occasional Uber to Wall Street. In the canyons down there he will find plenty of material.